The European Central Bank and the Bank of Japan will hold their first policy meetings of 2019 next week as concerns mount about a global downturn. 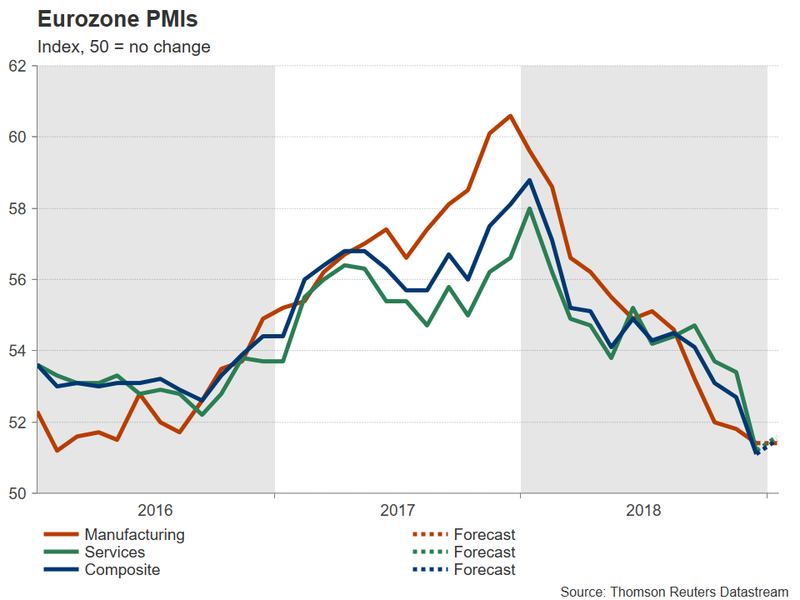 GDP figures out of China could underscore the worsening outlook, while flash PMIs out of the Eurozone will also be watched for the latest glimpse on the growth picture. Jobs numbers will be in focus too as Australia and the UK publish monthly labour market stats. One event that isn’t expected to attract much attention though, is the World Economic Forum on January 22-25. Key central bank figures will be staying away from the annual pilgrimage to Davos, meaning there’s unlikely to be anything market moving coming out of this year’s Forum. Investors will be on alert on Monday when China will release its estimates for economic growth for the fourth quarter of 2018. 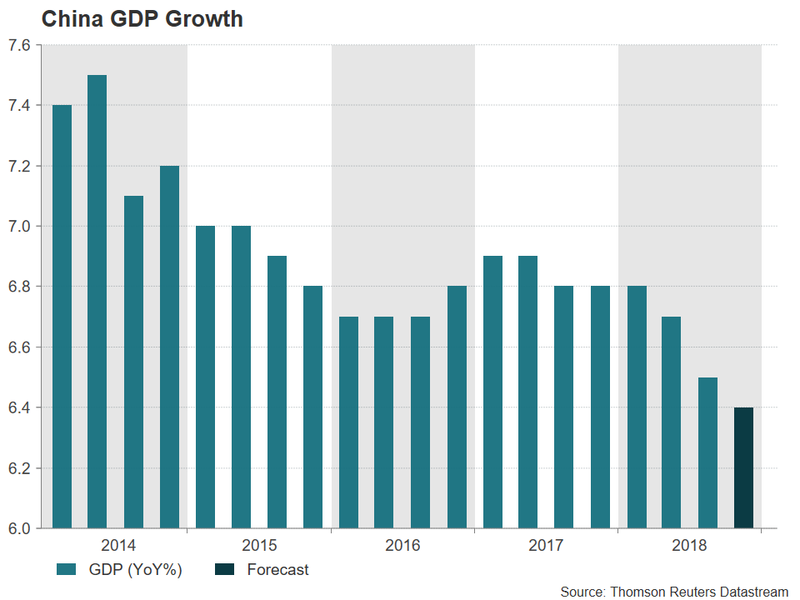 China’s GDP is forecast to have expanded by 6.4% year-on-year between October-December. If confirmed, that would make it the weakest growth since 2009 at the height of the financial crisis. Along with the GDP report, data on fixed asset investment, industrial output and retail sales for December will be released too. Lower-than-expected figures could send markets into a tailspin. However, any fallout would probably be limited given the series of stimulus measures announced recently by Chinese authorities. The Australian dollar is likely to bear the brunt of any data miss among the major currencies as the aussie is often considered a liquid proxy for the Chinese yuan. The aussie would be at risk of falling back below the $0.71 level versus the US dollar if there is a sharp sell-off. However, the Australian currency could seek some support from domestic jobs data due on Thursday. The Australian economy is expected to have added a 16.5k jobs in December, lower than the previous month but still a solid figure. The New Zealand dollar’s ascent to 4-week highs this week didn’t prove sustainable as shaky risk appetite pulled the currency lower. The kiwi could face further challenges next week if quarterly inflation numbers disappoint. The annual rate of the consumer price index (CPI), due on Wednesday, is expected to have eased from 1.9% to 1.8% in the fourth quarter. 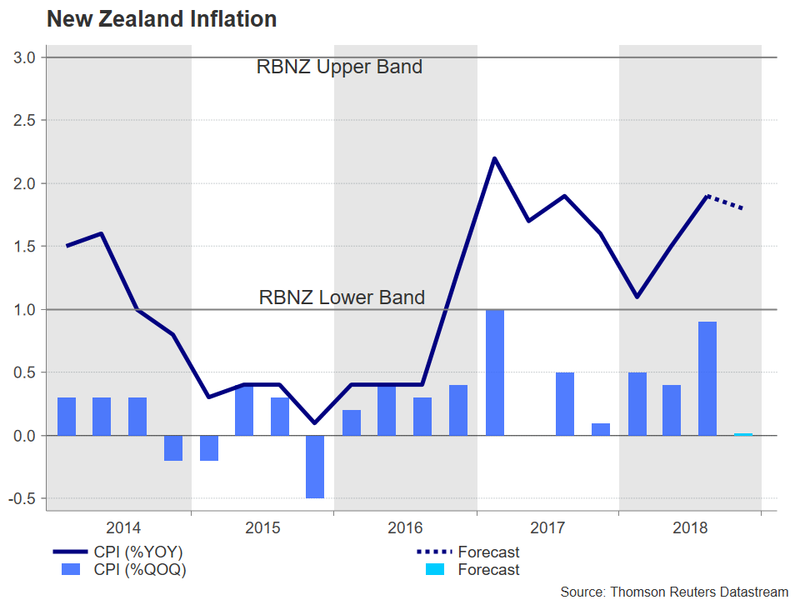 While this would still be within the Reserve Bank of New Zealand’s 1-3% target band, a move south of the 2% central rate could worry policymakers and push up the odds that the next move in rates would be down. The Bank of Japan will conclude its two-day monetary policy meeting on Wednesday and is widely anticipated to keep its stimulus program unchanged. However, there is speculation the Bank will once again be forced to revise down its inflation forecasts as the 2% price goal remains elusive. The slowdown in global growth, and more recently, the slump in oil prices, will likely drive inflation lower in the coming months, even as the BoJ expresses unease about the possible side effects from a prolonged period of ultra-loose monetary policy. December trade figures will also be released on Wednesday, along with the Nikkei/Markit flash manufacturing PMI for January. 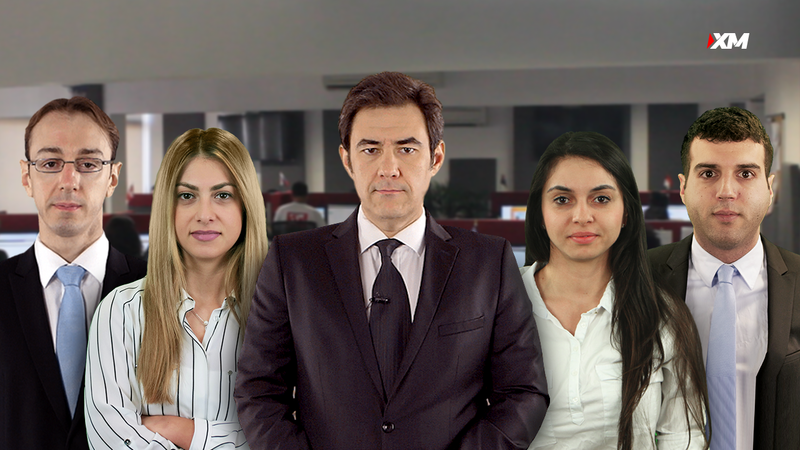 A surprise miss in exports growth, combined with a downbeat policy statement from the BoJ could pressure the yen, which recently scaled multi-year highs against some of its major peers such as the euro, pound and aussie. However, if the BoJ strikes a cautiously optimistic tone, the yen could appreciate somewhat. The US government shutdown, which has now become the longest in history, will once again be playing havoc with the economic schedule, with Friday’s durable goods orders for December likely to be delayed. But apart from the disruption to the data flow, the longer the shutdown drags on the bigger the impact will be on GDP growth. In the absence of any effort by the White House and the Democrats to resolve their row over funding for Trump’s Mexican border wall, market angst could begin to intensify and weigh on the dollar. But regardless of the shutdown, the US calendar is looking bare, with markets being shut on Monday for Martin Luther King Day and the only other notable releases being Tuesday’s existing home sales for December and Thursday’s flash manufacturing and services PMIs. 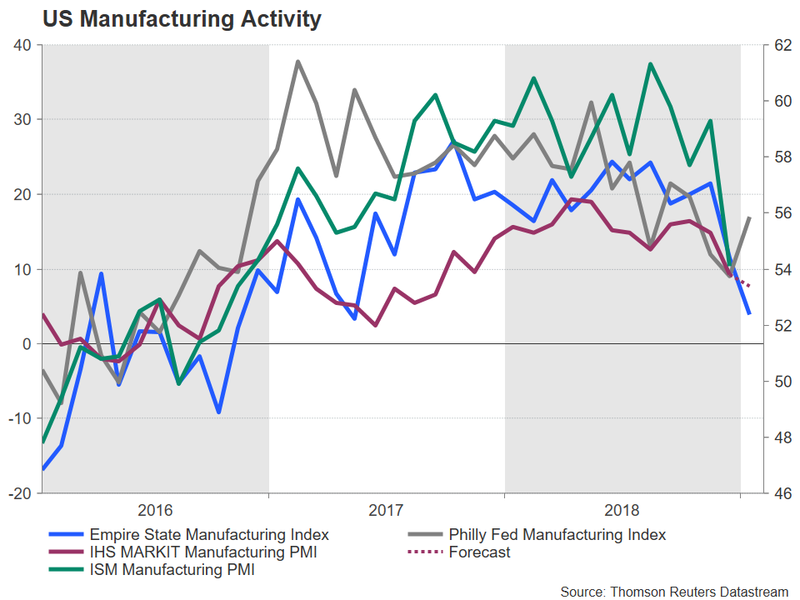 Given the shortage of indicators, the IHS Markit manufacturing PMI could draw more attention than usual, especially if it points to unexpected weakness in the US economy. North of the border, the Canadian dollar will be hoping for some positive boost from Canadian data after its oil-led rally came to a halt last week. First up are November manufacturing sales on Tuesday, followed by retail sales on Wednesday, also for November. Traders hoping to see Brexit headlines subsiding in the coming days following the crucial Parliamentary vote this week will be disappointed. In fact, Brexit will probably dominate the start of the week as Theresa May will on Monday unveil her ‘Plan B’ after her Withdrawal Agreement was crushingly defeated in Parliament. In the meantime, the prime minister and senior government members have been reaching out to opposition parties to reach consensus on a way forward. If her proposals on Monday fall short of something that stands a chance of being approved by MPs, the pound could gyrate again in forex markets. It should be noted though that the vote on the new plan won’t take place until January 29. On the data front, UK jobs figures for November will be watched on Tuesday. The British labour market has so far withstood the cooling economy and wage growth even picked up in the three months to October, reaching a more than 10-year high of 3.3% y/y. If the higher growth in average weekly earnings proves sustainable, it could ease fears of a sharper slowdown as this would be supportive of domestic demand. The European Central Bank’s policy meeting will be the focal point in Europe next week as the euro area economy continues to lose momentum, worrying both policymakers and investors. Helping the ECB with their latest assessment will be a number of important business surveys. The ZEW economic sentiment gauge out of Germany will be watched on Tuesday. The index is forecast to improve only marginally in January. On Thursday, the latest IHS Markit PMIs for the Eurozone are due. The manufacturing PMI is forecast to stay unchanged in January, but analysts expect the services PMI to improve slightly in January’s flash reading. Finally, on Friday, another German barometer – the Ifo business climate index – will be published. Forecasts are for the index to decline to fresh two-year lows in January. If the data show another marked deterioration in Eurozone business activity, the ECB could signal a possible change to its forward guidance on interest rates in the coming meetings, although the Bank is unlikely to alter anything in its statement just yet. That would put the focus on President Mario Draghi when he holds his post-meeting press conference. Draghi will probably be quizzed by reporters on what the central bank intends to do if the economic backdrop in the Eurozone continues to worsen. Any indication that the Governing Council discussed delaying a rate hike or even loosening policy could send the euro tumbling against the greenback. Another monetary policy meeting to watch will be that by the Norges Bank on Thursday. Norway’s central bank raised rates back in September for the first time in seven years and is projecting another increase in March. However, given the recent slide in oil – a major export earner for Norway – the Bank could take a more cautious approach and signal a delay. The Norwegian krone could resume its downtrend against the euro and the dollar if there is a shift in policy.